Children are known for how much they love to play make-believe, and StoryKid, an app introduced today during the Disrupt Hackathon in New York, takes this and gives it a new twist by offering a series of pictures as visual cues for a child to tell a story based around them. StoryKid is aimed at children aged 2 to 5 who are already talking but may either be too young or are just starting to write. Created by two comparative literature PhD students from Columbia University, the idea is that this will help bring children into the world of story telling and literature. And as co-founder Tianjiao Yu tells me, it can also be used by parents when they’ve run out of inspiration for their own made-up bedtime stories. 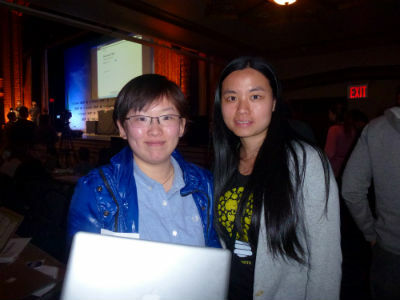 Yu, left, says that she learned to code to create the app, while her co-founder Lu Xiong, right, boned up on design and user experience to work on the visual elements. Their motivation to do this was to take what they’ve been learning out of the ivory towers of higher learning. “Both of us are interested in the humanities and making them accessible to everyone,” Yu says. “We find creating an app is the perfect way to do this.” StoryKid is one of three ideas that the pair have to make literature more accessible to people. The other two, however, are more about discovery of existing literature rather than creating new things. The two are on the lookout now for a third coder who can help with creating these. Indeed, even StoryKid, as it was created this weekend in the Hackathon, is still at an early stage of where they would like for it to be. The pictures, she notes, for today’s demo were sourced from visual search engine Niice but they will come from other sources when the actual app launches in about 1.5 months. And although the app, such as it is now, is aimed at toddlers making up their own stories, you can see, too, how this could also be used for older children who are writing more, to write down their narratives once they have them together. That sounds like schoolwork disguised as leisurely app time, but Yu emphasizes that the “main idea is to have fun, and to make literature fun.” I for one look forward to introducing things like this to my kids to see what they think.